Brayden’s first big holiday of his life was Independence Day. We lived very close to the parade route, and as a first time mom, I was so excited to get him all dressed up in his holiday outfit and take him to the parade. Despite the fact that he was a mere 6 weeks old, I was ready to make some memories! Well, that we did. He screamed. And screamed. And screamed some more. At some point, a kind woman, a mother herself, came to me and offered for me to take Brayden up to her porch. She lived on the parade route, so I would still be at the parade, but I would be removed from the major noise and action. It worked. He calmed down and we both were much happier with our parade experience. Since that day, I have had three more children and many more parades. Parades are a fun tradition, but they are not exactly baby-friendly. Some babies, like Kaitlyn, will just go to sleep and shut out the noise and stimulation. Other’s, like Brayden, will react with screaming. 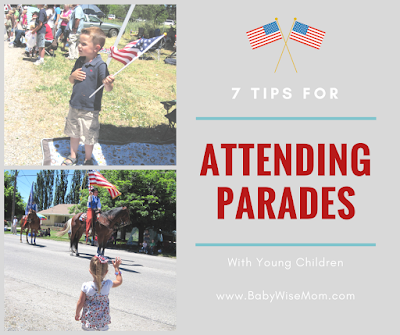 Here are some tips to help you get through your next parade with a little one. This post contains affiliate links. With a baby on up through toddler and preschooler, you will want a location with certain perks. One is shade. Everyone wants shade, right? So that can be hard to find. For one parade we frequent, we just bring our own shade with us. We bring an EZ up pop up shade so we can have shade. That way, we don’t have to go hours early to find a shady spot. We pull up a few minutes before the parade starts, set up in the hot, sunny spot, and we are on our way. A huge benefit to this is that it allows us to let our baby sleep at home until the last possible minute. I also highly recommend a spot where you can back away from the parade route if possible. If you have a baby or child who is upset by all of the noise, you will want to be able to get away from the route like I did with Brayden. A spot with a fence right behind you isn’t the ideal spot for you. If you have a baby, you won’t be feeding baby water, but it is wise to have the ability to easily nurse or bottle feed your baby if needed. Parades are often hot places, so your baby or child will need to be hydrated. If your child is eating solid foods, have some food or snacks on hand. A hungry child is never a fun child, so it is always wise to have some snacks to turn to in a pinch. Make sure you have diapers, wipes, underwear for the potty training child, etc. You might even throw in some small toys to play with while you wait. Parades are fun, but they are also highly overwhelming and can be scary to a young child. It can help to have a favorite stuffed animal or blanket there for your child to turn to if/when she feels overwhelmed. It is great to have chairs or a blanket to sit on. If you have a mobile child who likes to wander, a stroller is a great place to put that child during the parade. It of course is a great place for a non-mobile child to watch the parade, also. A stroller is also handy if you have a walk a ways from your vehicle to your watching spot. When my children were young, my parents would often bring along some head phones for my children to wear at parades. They are just the headphones my dad uses when he mows the lawn. We often bring a big cooler of water to parades. At the least, we bring a water bottle for each person. A squirt bottle full of cool water can be nice for cooling people down, also. A little cooler of otter pops can go a long way to keeping people feeling cool enough. If you are going to a parade in cold weather, be sure you dress warm enough for the weather. 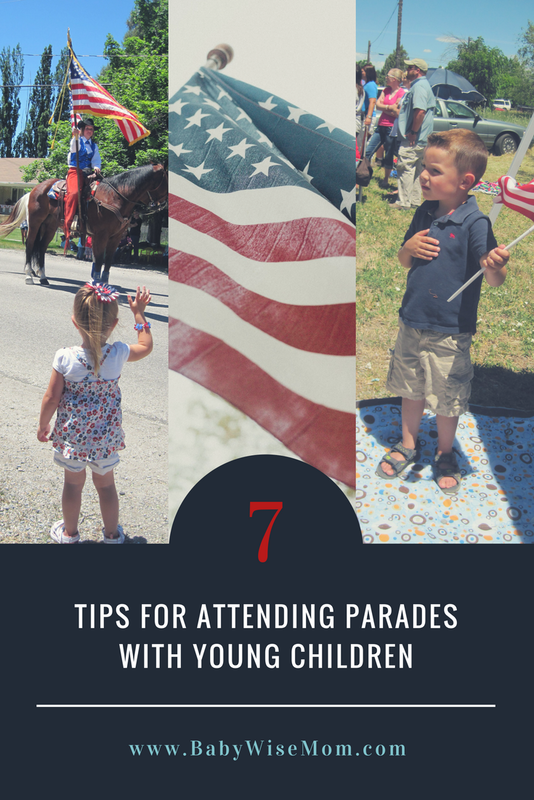 These seven tips can help you have a successful parade. What tips have you found helpful for parades? Comment and let me know!